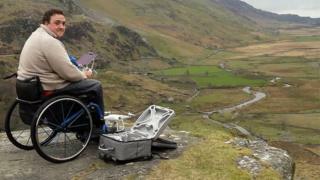 A man who was tipped out of his wheelchair by thieves who stole his photography kit has said the attack has knocked his confidence. Stephen Halsey, 30, a photography student from Hoylake was taking pictures in Ashton Park, Merseyside, at about 12:30 GMT on Tuesday when he was approached by two unknown men. They stole his camera and other equipment before running off. It has been described as a "despicable" crime by police. Mr Halsey said it has made him "think twice" about going out on his own. But he has been "absolutely overwhelmed" by messages of support, which he said meant "more than I could ever say". Police are appealing for a film crew who were in the area at the time, possibly working for a local estate agent, to get in touch. The offenders are described as white, aged between 30 and 40, with one wearing a black coat and the other wearing a blue coat. Det Insp Paul Lamb, from Merseyside Police, said: "It is despicable that a man in a wheelchair could be targeted in this way and we are determined to find those responsible and bring them to justice. "The victim is being supported by officers and we take any reports of robbery extremely seriously, but to target someone vulnerable is particularly alarming." He added that anyone who had been offered a camera or related equipment in the area should contact the police.